Rapper Meek Mill, a worldwide symbol for criminal justice reform, joins Gov. Tom Wolf and lawmakers in calling for reforms to Pennsylvania's criminal justice system. 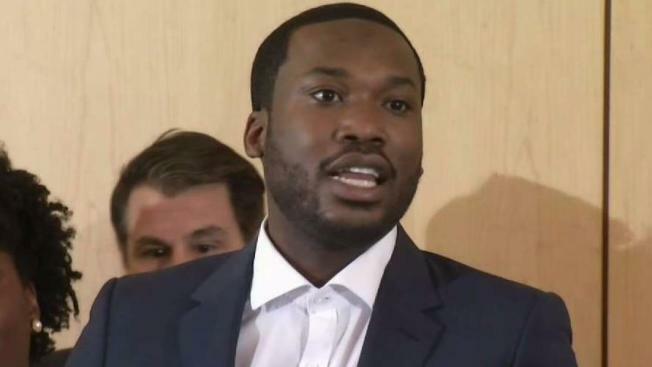 Recently released rapper Meek Mill is calling for Criminal Justice Reform. And he's being backed by Pennsylvania's Governor. Philadelphia rapper Meek Mill and Pennsylvania Gov. Tom Wolf called for criminal justice reform at an event held symbolically in the shadow of Independence Hall Thursday morning. The unlikely pair joined other advocates and local lawmakers, including Rep. Dwight Evans, D-Pa., in a "call to action" from inside the National Constitution Center. Mill, whose legal name is Robert Williams, said he was raised in a neighborhood where young black men constantly came in contact with police. "I'm still not a free man," he said. "I always feel like my freedom could be taken." The Philadelphia native battled nerves as he thanked supporters and spoke about wanting to raise his 6-year-old son. He was released on bail last month after the Pennsylvania Supreme Court intervened following a prolonged legal battle dating to November when the 30-year-old was sentenced to two to four years in prison for violating his probation. After his release, Mill celebrated at the Sixers playoff game, where he sat next to Wolf and other celebrities, including comedian Kevin Hart. Speaking on Thursday, Wolf said that Mill's case put a spotlight on the changes needed in Pennsylvania's criminal justice system, which must be "better and fairer for everyone." “The debate about how we can fix our criminal justice system is complicated, and over time that debate has changed to reflect the modern realities and issues present in our system,” Wolf said. Among other changes, Wolf wants to stop "technical parole violations" from landing people in jail, he said. Echoing that sentiment, Mill said he believes people struggling with addiction should not be punished for drug use. He, too, was addicted to opioids and credited his probation officer for helping him enter rehab, Mill said. The rapper failed a drug test while on probation for his initial 2007 arrest, one of five violations that landed him in prison. Philadelphia District Attorney Larry Krasner, who did not join Mill and Wolf Thursday, told NBC10 Wednesday that his office is currently reviewing the case. Common Pleas Judge Genece Brinkley has about 45 days to decide whether she will reverse Mill's conviction, according to Krasner. If she does, his office must then decide whether to drop the case or come up with a resolution. The Pennsylvania District Attorneys Association also responded to Wolf and Mill by saying they support "responsible reforms." "We are always willing to take a look at smart, balanced reforms," association president and Berks County District Attorney John Adams said. Adams' statement went on to call Mill's case is unique. "We cannot, however, let one individual under very unique circumstances indict an entire system," Adams said. "As this conversation moves forward, it is imperative that policymakers look through the lens of public safety and ensure fairness for defendants and victims. We caution against the wholesale elimination of appropriate consequences and accountability in the criminal justice system cloaked in the concept of reform."